Respirators protect a person in two basic ways. The first is by the removal of contaminants from the air. Respirators of this type include particulate respirators, which filter out airborne particles, and air-purifying respirators with cartridges/canisters which filter out chemicals and gases. 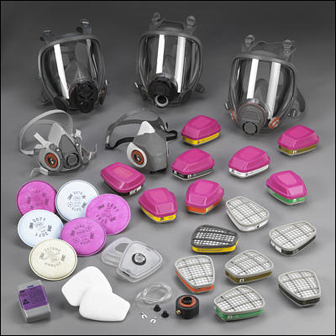 Other respirators protect by supplying clean respirable air from another source. Respirators that fall into this category include airline respirators, which use compressed air from a remote source, and self-contained breathing apparatus (SCBA), which include their own air supply. At the University we attempt to engineer out any respirable hazards, but in some cases this is not possible and a respirator may need to be utilized. The Environment, Health, and Safety (EH&S) office manages the respirator protection program and certifies individuals in the use of a respirator through training and fit testing. If you believe work that you conduct may require the use of a respirator contact the EH&S office to have the work processes reviewed to determine the need for respiratory protection.